Trump Treasury Pick: Was This Election Goldman vs. Sachs? Bloomberg reports: “Mnuchin Said to Be Top Treasury Pick Among Trump’s Advisers” which states: “Former Goldman Sachs Group Inc. partner Steven Mnuchin has been recommended by Donald Trump’s transition team to serve as Treasury secretary, according to two people familiar with the process, and the choice is awaiting the president-elect’s final decision. “Mnuchin, the campaign’s national finance chairman, has been considered the leading candidate for the job. Trump has displayed a pattern of loyalty to his closest campaign allies in early administration selections, and Mnuchin, 53, had signed on at a time when many from Wall Street stayed away. “Before joining Trump, Mnuchin rose through the kind of elite institutions the president-elect spent his campaign vilifying. 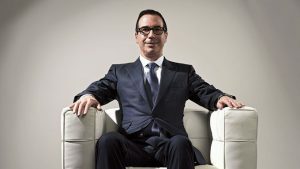 Mnuchin was tapped into Yale’s Skull and Bones secret society, became a Goldman Sachs partner like his father before him, ran a hedge fund, worked with George Soros, funded Hollywood blockbusters and bought a failed bank, IndyMac, with billionaires including John Paulson. They renamed it OneWest, drew protests for foreclosing on U.S. borrowers, and ultimately generated considerable profits, selling the business last year to CIT Group Inc. for $3.4 billion. “In October 2011 about 100 protesters marched on his Los Angeles mansion, angry about foreclosures. ‘Steve Mnuchin,’ one sign read, ‘Stop taking our homes.’ He and his partners completed the bank’s sale in August 2015. “California Reinvestment Coalition deputy director Kevin Stein, whose group has accused OneWest of particularly aggressive foreclosure practices, criticized Mnuchin’s legacy on Monday. Naylor is financial policy advocate with Public Citizen’s Congress Watch Division. The group just released a statement: “Fox in the Henhouse: Leading Trump Candidate for Treasury Said to Be Former Goldman Sachs Partner With Ties to Great Recession,” which states: ‘According to media reports, former Goldman Sachs Group Inc. partner Steven Mnuchin is the leading candidate to serve as U.S. Treasury secretary as Trump nears his final decision. Mnuchin has served as Trump’s chief fundraiser since this summer. Mnuchin, described in some reports as an “an investor with so much Wall Street blood in his veins,’ is a former partner at Goldman Sachs, an investment bank that contributed heavily to the financial catastrophe that was the Great Recession of 2008.